Welcome and Congratulations to Lufthansa Technik! There are few things more exciting than the moment when a multi-year project truly becomes a reality. I had the honor of witnessing that this weekend, when I joined Puerto Rico Governor Alejandro García Padilla; Dr. Johannes Bussmann, Chairman of the Executive Board of Lufthansa Technik; Simone Menne, member of the Executive Board of Deutsche Lufthansa AG; German Ambassador Dr. Peter Wittig; and hundreds of new Lufthansa employees to celebrate the completion of the Lufthansa Technik Puerto Rico (LTPR) maintenance, repair and overhaul (MRO) facility. 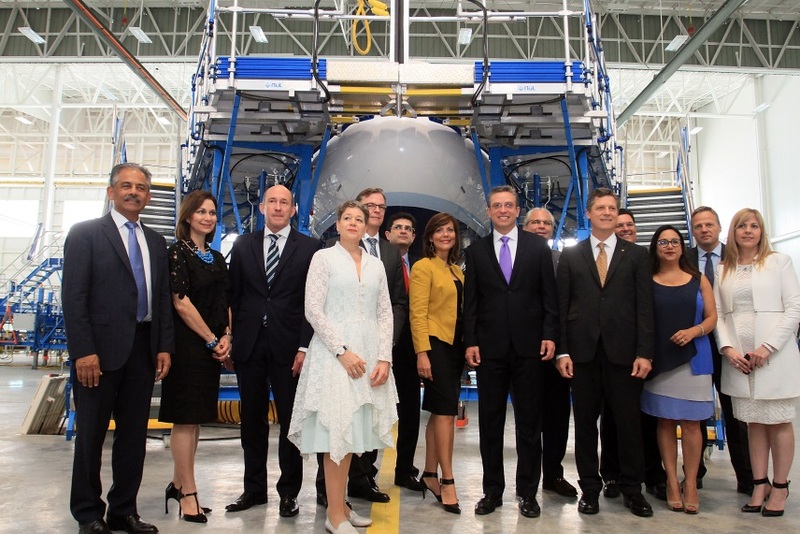 Dignitaries celebrate the completion of the Lufthansa Technik Puerto Rico (LTPR) maintenance, repair and overhaul (MRO) facility. Congratulations and thank you to the teams from Puerto Rico and Lufthansa Technik. Back in April 2014, I also had the pleasure of joining them when the deal was first announced. The work undertaken by these teams, which began well before 2014, is impressive: Puerto Rico competed effectively to win the deal and bring these jobs to the United States. Lufthansa Technik has invested significantly in this project, which it completed on time. Local contractors have been building the facility itself. Companies like Spirit and JetBlue made commitments to use the facility for heavy maintenance support. And of course, newly minted LTPR employees have been working hard and preparing to grow the business – and their careers – here. Many even spent six months training in different Lufthansa Technik locations in Europe. The results: A gleaming new 215,000 square foot hangar that is serving short and medium haul aircraft, with more than 200 people employed on site. Lufthansa has also built the foundation for a long-term workforce development partnership with the University of Puerto Rico and the Commonwealth’s Department of Education. Lufthansa anticipates offering high-skilled jobs for 400 local employees by early 2017, with an estimated economic impact of $2.2 billion during the next 30 years. This investment is creating new jobs with valuable training and opportunities for growth, and that means a lot to the families here. That’s why SelectUSA was created. Our job is to help U.S. locations compete for investment globally, and to serve as a single point of contact for investors, like Lufthansa, at the federal level. We help investors find the information they need to make decisions; connect to the right people at the local level; navigate the federal regulatory system; and find solutions to issues related to the federal government. We aim to make it easier for companies to set up operations in the United States and create high-quality jobs. To facilitate this investment, SelectUSA coordinated an effort across the federal government, including Vice President Joe Biden, Secretary of Commerce Penny Pritzker, the President’s Taskforce on Puerto Rico, and many others, to present Lufthansa with the case for locating their investment in the United States. We have continued to work with Lufthansa and Puerto Rico. During the past two years, we have sincerely appreciated their spirit of cooperation and their willingness to share their experience and best practices with other investors and U.S. economic developers. This spirit was evidenced throughout this weekend’s event, including one particularly unique element. The company brought the Lufthansa Orchestra, composed entirely of Lufthansa employees, to provide music for the event. This underscores the investment they are making in their people, and that now includes the people of Puerto Rico.